Last week’s post was devoted to America’s first Secretary of War, Henry Knox. 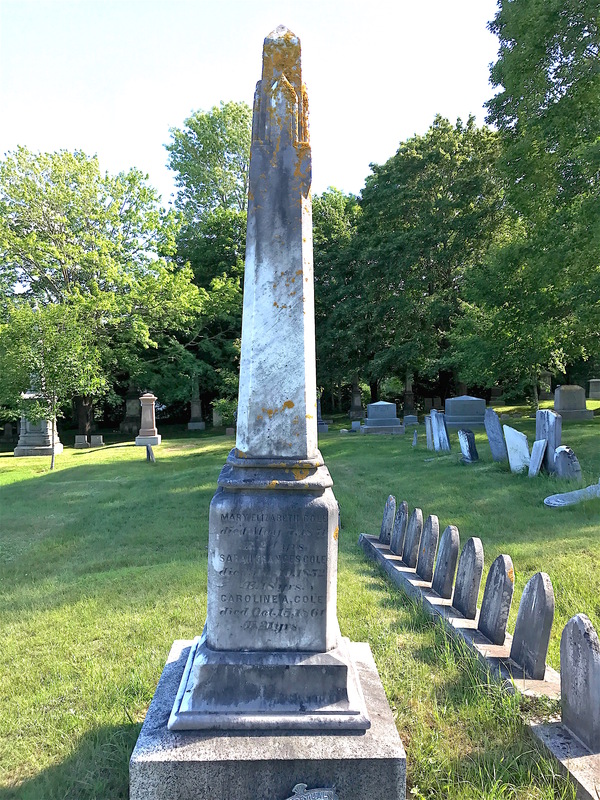 He’s buried in Thomaston, Maine, the town where he and his wife moved to after he retired from his service in President George Washington’s cabinet. 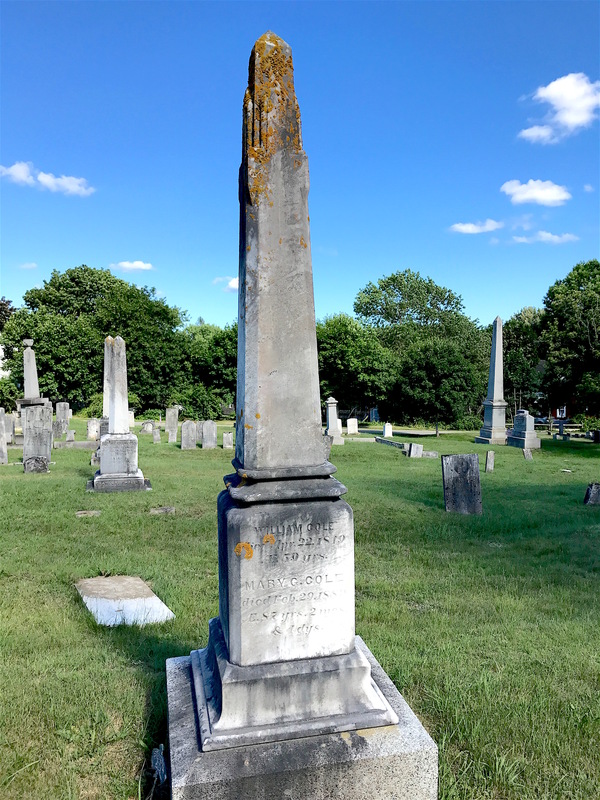 When you visit Knox’ grave, it’s hard to tell which cemetery he’s buried in because Elm Grove is situated next to Thomaston Village Cemetery. Find a Grave has him listed at Elm Grove but when I looked at a map provided by the Thomaston city government’s web page, he’s actually in the Thomaston Village Cemetery. This was further confirmed to me by an 1871 postcard I found of the Thomaston Village Cemetery that stated the land was donated to the town by Henry and Lucy Knox in 1802. I was excited to see this postcard because among my photos I had this to compare it to now. 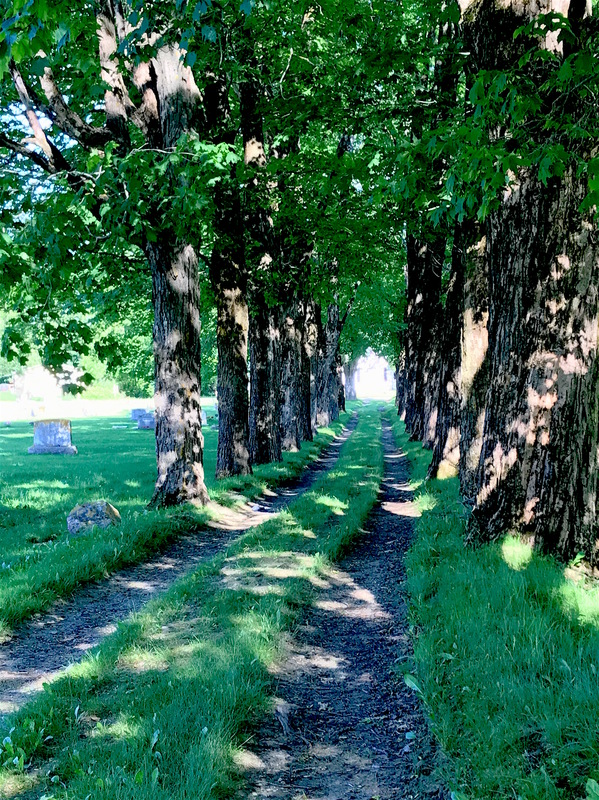 This is what Thomaston Village Cemetery looks like today. 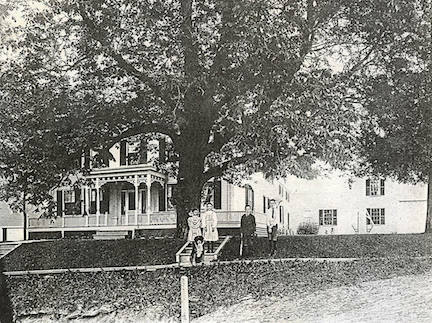 From what I can tell, Elm Grove came later in 1836. By 1857, the 39 lots on the northern side had been sold. 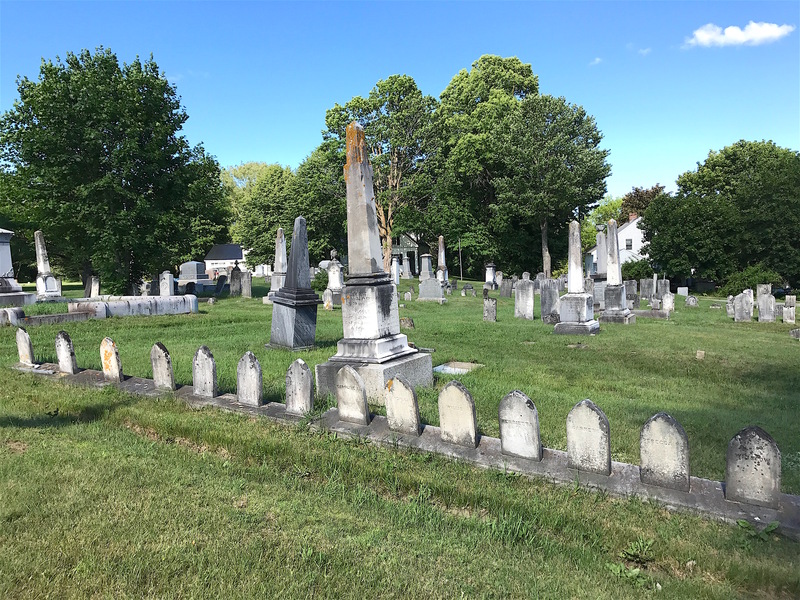 In 1858, a group of 22 residents agreed to pay $200 for the unoccupied land in the cemetery with a strip extending across Dwight Street, belonging to the Sullivan Dwight Estate. Each of the proprietors was assessed $10 to pay expenses. The by-laws were drawn up and signed by Hezekiah Prince. According to the agreement, there were 58 lots costing $25 each. You can tell that Elm Grove is the final resting place of the more well heeled Thomastonians by the large size of some of the monuments and the elaborateness of the design. 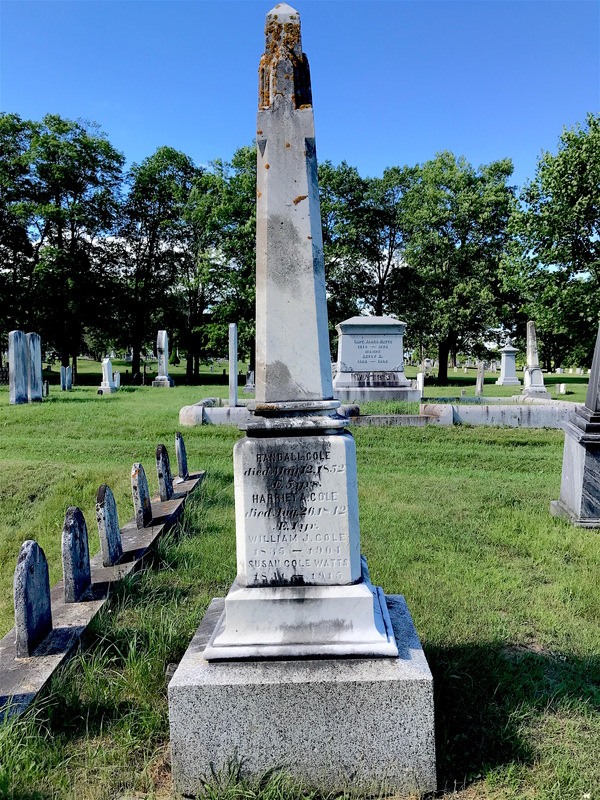 One of the plots in the Thomaston Village Cemetery that is impossible to miss is for the Cole family. When you see one large marker fronted by 14 individual small ones, you stop to take a look. William and Mary Cole had several children, but only a few lived long lives. Born in 1791 in Virginia, William Cole came to Thomaston from Nashville, Tenn. to do business on the Mill River. His brother, John P. Cole, also left Nashville for Maine. Both married and started families there. William married Mary G. Dodge, daughter of Dr. Ezekiel and Susannah Winslow Dodge, in 1825. Mary was 24 at the time. William would eventually move his business to Rockland, Maine, where he died in April 1849 at the age of 59. Mary Dodge Cole outlived her husband by several decades. According to the books I found, William and Mary had 12 children but there are 13 names on the monument. Seven of them died in infancy/childhood. Three daughters died in early adulthood and the remaining three children married and lived long lives. One puzzle amid the children is Willis, whose name appears on one of the small stones and on the family monument. Yet he appears in no genealogical records or in the actual cemetery records as having been buried there. William built what would become known as the Cole House. It is now the administrative center of the Knox Museum/Montpelier. I didn’t know that when we visited but I saw it on the edge of the property. 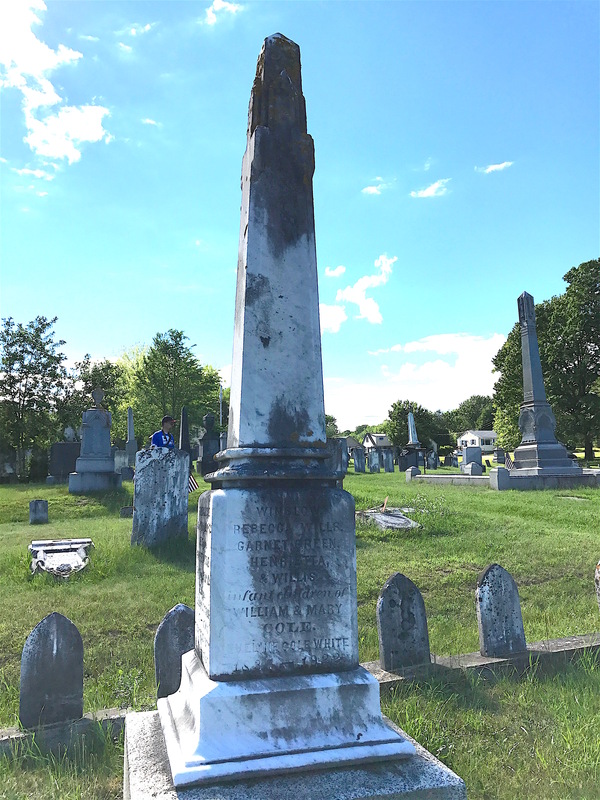 Susan Winslow Cole, born in September 1831 (although the monument says 1832), married Capt. Artemus Watts, becoming his second wife. According to the 1880 Census, Artemus was a retired shipmaster by that time. Susan’s mother, Mary, was living with them. 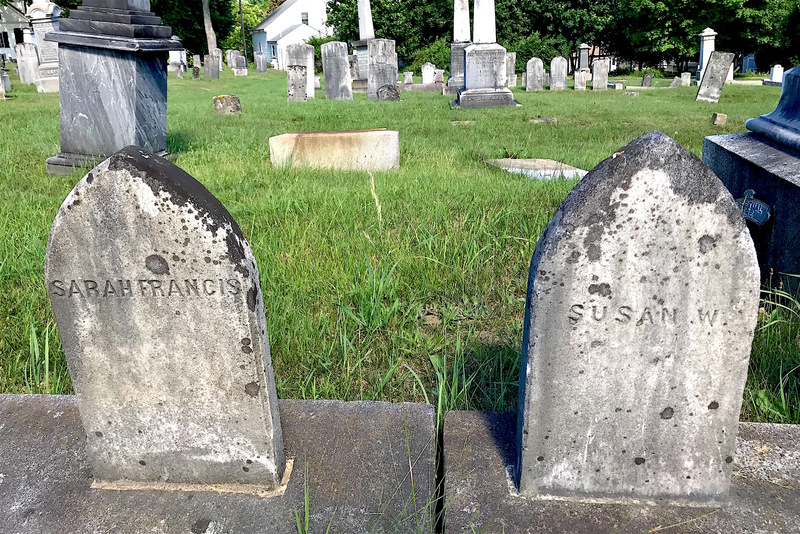 Susan died in 1915 and is actually buried in another part of the cemetery with her husband. Sarah Francis Cole and Susan Winslow Cole Watts’ markers are two of 14 lined up in a row. Brother William J. Cole spent the first years of his life in Thomaston but would eventually move to California where he worked as a commission merchant. He died of tuberculosis in Phoenix, Ariz. in 1904. His death records indicate his body was sent to Philadelphia, Pa. so it’s possible his inscription on the monument is a cenotaph. While William J. Cole’s name is on the Cole monument, records indicate his body was sent to Philadelphia for burial after his death in Arizona. Eveline Cole was born in 1837 and married George White in Santa Cruz, Calif. in 1865. 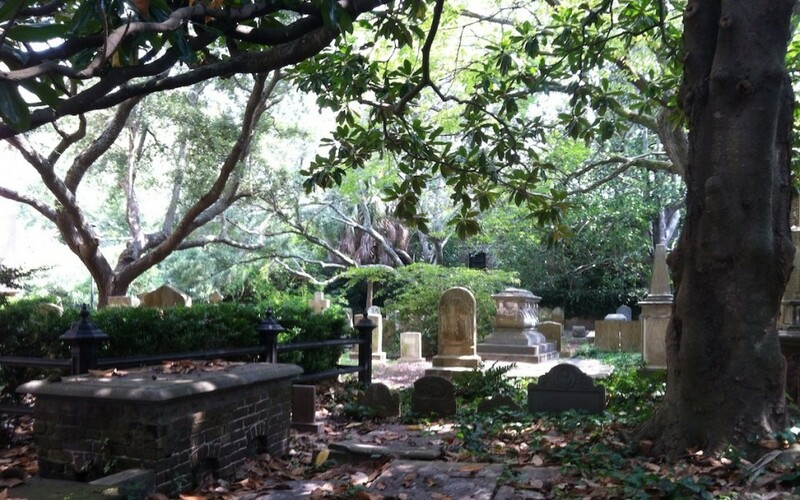 She died in California in 1922 and is likely buried there since she doesn’t appear as actually having been buried at Thomaston in the cemetery’s burial records. So hers may be a cenotaph as well. Five of the Cole children who died in infancy are listed on this side of the monument, along with Eveline Cole White who died in California in 1922. Of all the Cole children, Eveline lived the longest. As you can see on this side of the monument, Winslow, Rebecca, Garnet, Henrietta and Willis are all listed as having died in infancy. Sisters Mary Elizabeth, Sarah Francis and Caroline, who all died in young adulthood, share one side of the monument. 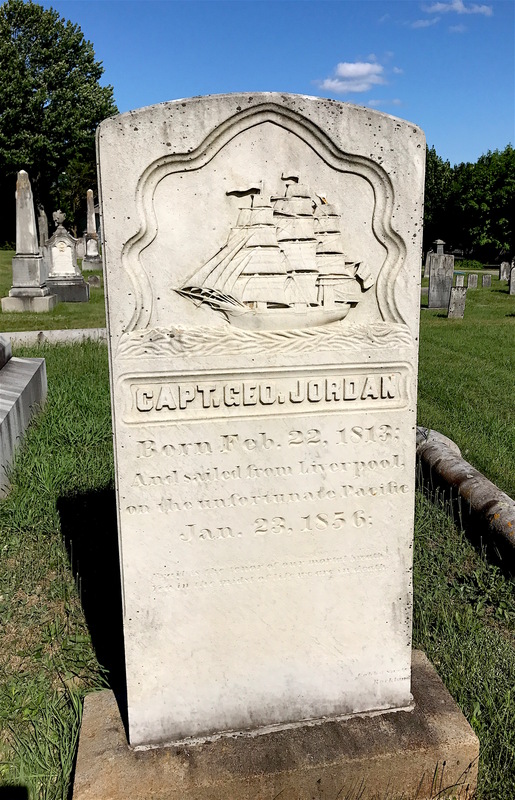 It wouldn’t be a Maine cemetery without a sailor lost at sea. That brings me to the story of Captain George Jordan. Thanks to Pat Higgins’ site, the Maine Story, I got the scoop on what happened to him on “the unfortunate Pacific” mentioned on his marker. Born in 1813, Captain Jordan was married to Betsy Masters and had two children, Octavia and Newell (the first, George, died in infancy). In late 1855, he sailed to Coxhaven, England where he sold his ship. He then booked passage home to Maine on the steamship Pacific and it proved a fateful decision. 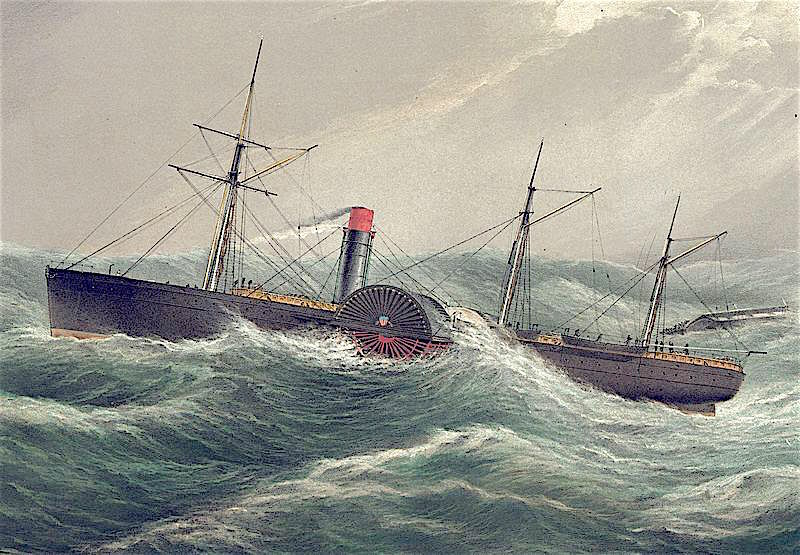 The Pacific was one of four wooden steam-powered ships built with government subsidies by the Collins Company of New York to compete with the British Cunard Line for transatlantic trade. Launched in 1849, it was driven by two paddle wheels on opposite sides of the ship and powered by side lever engines. It carried about 300 people in luxurious accommodations. Pacific’s final voyage took place on January 23, 1856 in Liverpool, setting sail with 45 passengers (including George Jordan) and 141 crew members. Commanding the ship was Captain Asa Eldridge, a skillful mariner. The Pacific was never seen again. One can’t help but think of a similar record-breaking ship that would encounter icebergs in 1912. It, too, would meet a disastrous fate. I didn’t notice until later that Capt. Jordan is buried next to another marker for the Watts family. You’ll recall that Susan Cole married a Watts. Capt. 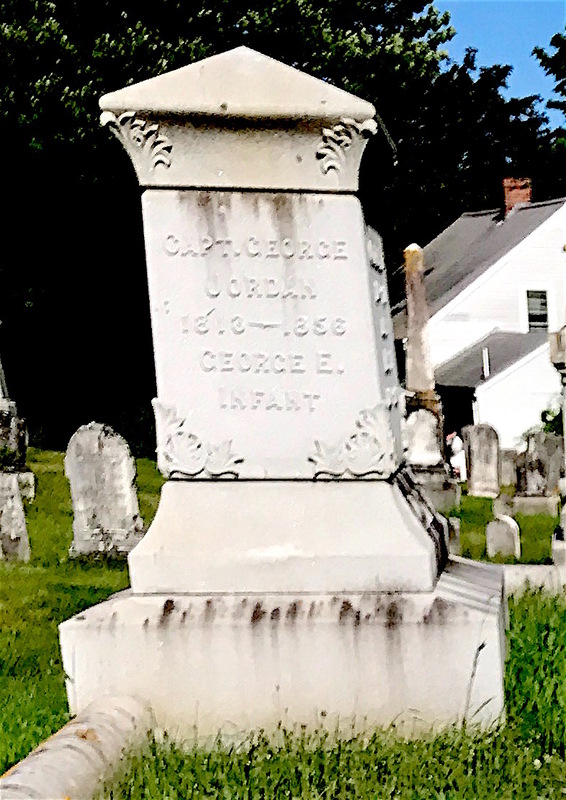 Jordan’s name and “Infant George Jordan” are on the side. Capt. Jordan and his infant son’s names are inscribed on the side of the Watts monument. But on the front are the names Betsy B. Watts and Captain James Watts. Widowed Besty Masters Jordan married Capt. Watts in November 1856 after Capt. Jordan was lost at sea. Capt. Watts already had two daughters of his own, Delia and Mary. Together, they had a son named James in 1862. Capt. Watts died in 1878. Newell Jordan was living in San Francisco, Calif. at the time of Betsy’s death in 1906 while James Watts was in Portland, Ore., according to Betsy’s will. Octavia Jordan married Clarence Leighton and would stay in the Maine area for her entire life. 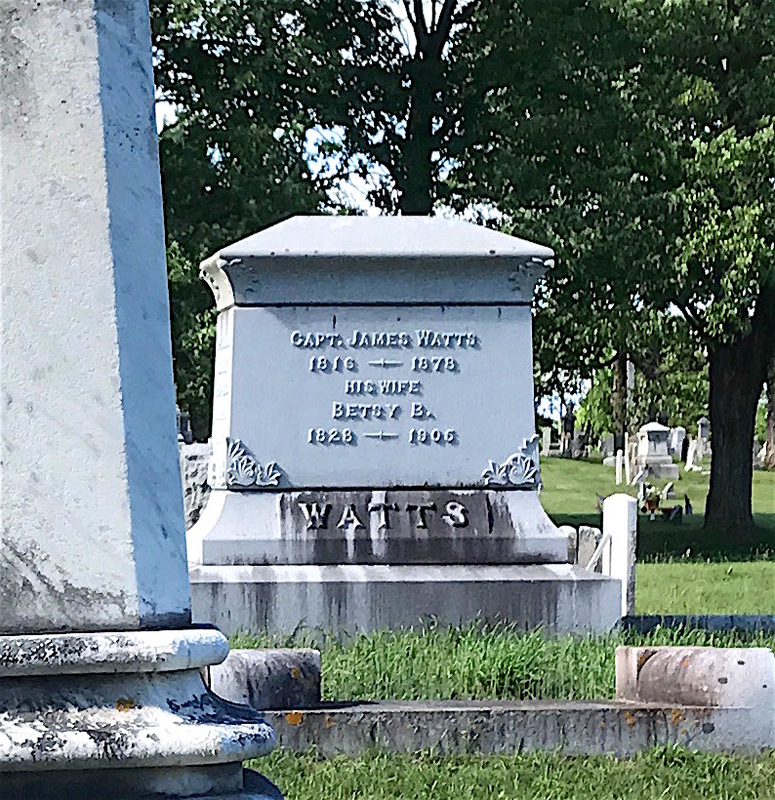 The Watts monument is buried quite close to the Cole family plot. 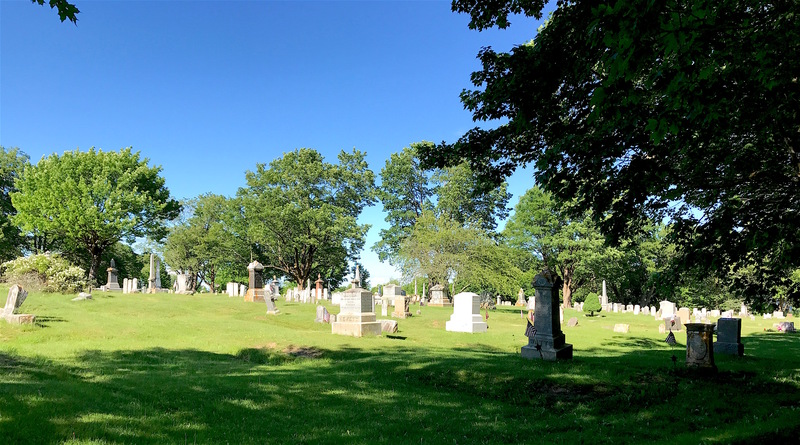 Next week, we’ll spend some time next door at Elm Grove Cemetery.